One-push-piece chronograph Henri Duvoisin watch with the mythical Valjoux 5, 3f mouvement19". Limited edition of 5 pieces numbered, red gold, made in Switzerland. The Henri Duvoisin one-push-piece chronograph is a combination of the beauty of the Henri Duvoisin watch cases and dials and the know-how of the mythical Valjoux SA factory. Fonded in 1901 by John and Charles Reymond, under the name of Reymond Brothers, the factory was located in Bioux (Vallé de Joux). Their movements were authenticated by the acronym R, an allusion to the family name of the owners. 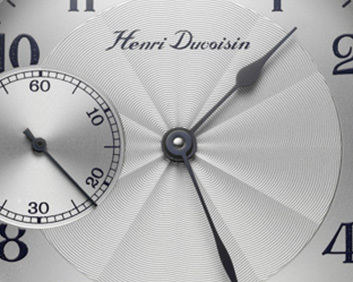 The adventure of the Henri Duvoisin brand name continues, always true to the ideal of quality horology. The latest addition to this collection is a new exclusive limited series of three 19’’ « one-push-piece chronographs, with Valjoux 5, 3f » movements dating from the 1910-1929 period, retired and chamfered by hand, as in bygone days.